The 5.5-22x56 may have been used but the mod0 left the crane with the 10x Leopold. Nightforce were added in the field. Thanks for the info. So, would my clone still be technically correct if I went with the NF or the Leupold? I just don't want to screw this up. my buddies team rifles had 16x Ultras. (5SFG) I have seen 5.5-×5x56 NXSs and 16x Leupolds Ultras. I'm sure 10xs went out but I don't personally know anyone who used one downrange. What scope and rings do you want? Here’s a quick picture of the stock kit that I took as soon as I got it out of the box. I couldn’t be happier with everything and can’t thank USMCSGT enough for hooking me up with it. He's an excellent guy to do business with and can't recommend him enought. As mentioned before, I’m waiting on Lilja for my Mod 0 (Tactical Contour? - not entirely certain which is the correct reference). I saw it mentioned somewhere that some Mod 0s were actually built with the Mod 5 contour, is this correct? If so, then I assume that whether or not it was appropriate would depend upon the serial number of the stock as to whether or not the Mod 5 contour would be appropriate. According to a ex-crane armorer, yes they did do a few Mod 5 contour barrels on a Mod 0. Is it correct for you build, hard to say. I know my stock that I got from USMCSGT is in excellent condition and nearly identical to yours and I built it in a late mod 0 style with the mod 5 barrel profile and fitted it for my Mk11 suppressor. That’s sort of where I went back and forth on the Mod 5 vs Mod 0 contour. Being that I live in NJ, I’ll never be able to fit a suppressor on this gun, so it just seemed to be a “better” choice for me to keep to the original Mod 0 profile. Is there a reference list of stock serial numbers somewhere? I’d love to figure out where mine fits in the timeline of the Mod 0. Here’s a quick picture of the stock kit that I took as soon as I got it out of the box. I couldn’t be happier with everything and can’t thank USMCSGT enough for hooking me up with it. He's an excellent guy to do business with and can't recommend him enough.. In my build I was going to go with the mk4 m1 10x mil-dot and I still may. My 10x was built in 1995 which would be in the era of the Mk13's. I base that on what I was told by Alan Brown and I feel that it may best the best option for an earlier clone. I do have a Mil-Spec 5.5-22x56 that is moa and does not have ZS that I may use. I will not shoot the mk13 that much so whatever scope I put on it will just sit in the safe anyway. I think that if you pick something you like and you are happy with it... that is what matters the most. I am not sure if any of the the information below will help you or not but it is what I have been able to gather. "That's all correct...I'm an retired SEAL and designed and used the first generation Mk13s. Most any of those scopes work as SEALs used whatever they wanted. At that period the teams had a member retire and join Nightforce, that's why the Teams moved that direction for a while. Now it's mostly Schmidt and Bender. " "Very few are out on the commercial market. They were sold as personal scopes to guys a while back and we occasionally sell them to certain individuals, so they exist on the commercial side, but they are reserved for military end use sale only. There also seem to be quite a few that walked off of the govt. books." I will not shoot the mk13 that much so whatever scope I put on it will just sit in the safe anyway. That's a shame, especially since you have access to steel out to 1250 yards. Thanks - I really couldn’t be happier with the stock that I picked. It’s going to a long 12 week wait for my barrel to ready. This should give me plenty of time to plan my optics decision. Seen some GI ammo in the PX for these just this am. Sure you guys loving through couple hundred of these torpedos at a shooting session. I made two big steps forward in my Mod 0 project this week. The biggest one was getting an awesome looking return stock kit from USMCSGT0331(which should hopefully be arriving today) and I got my barrel order placed with Lilja. I've already got my receiver, so I should be good to once my barrel arrives (the lead time is 12 weeks, so I'm looking at early September). The plan for now is to use this down time to track down the scope and rings. One Question: I'm in NJ, so a supressor isn't an option, but I still want to have the notches milled into the barrel to keep my build as accurate as possible. I haven't been able to find a decent picture of the muzzle end of Mod 0 barrel that has the notches but without the KAC attached. Could someone please post a picture without the can or provide a link to one? I spoke with Alan recently and he said that most mod 0's were not suppressed when they were built originally. He also said that it seems like the majority of the Mod 0's in the field that were photographed ended up being suppressed, hence why everyone thinks they should be suppressed. Tons and tons of moons ago, I was in the chow line out at Sabre Hall, when we passed a group of SEALs. I remembered one of their rifles being a Remington 700 with a tannish(?) stock. That was 1983/1984 time frame. I clearly remember the rifle not only not being suppressed, I remember it didn't even have a threaded barrel. What chambering it was, I do not know. At the time we assumed it to be 7.62x51. So, there we were lookin' right at it, and didn't know what it was. At the time, it was probably a Sionics.... and once guns got to the teams, they could be adapted for 'stuff' depending on what people wanted. Might have been a Mod 0 or a .308 of some kind. But as likely as not, a Mod 0. When I visited Alan, he told me the same as mentioned above... few Mod 0's were suppressed from Crane. But things happened in the field, too. Just because a rifle left Crane un-threaded doesn't mean it wasn't done later. He also noted that they shipped rifles with scopes they could 'get' at the time. 10X scopes... 16x scopes. Various reticles, including the target dot (as on mine). There was not a lot of tier-one gear when these were being shipped. Leupold was making some of these scopes in very small batches. Crane was taking whatever it could get. He also said that it was not as common as we think to have folks buy their own stuff... or to get 'outside' gear. In special missions units, it happened some. But for the most part, the Seal and SF groups used the equipment they had. Though a lot of swapping took place. 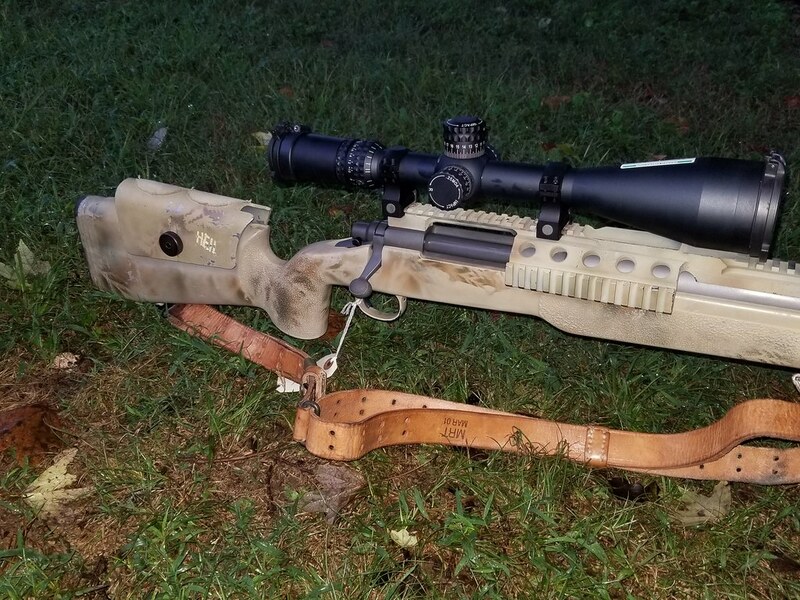 Don't need that scope on your Barrett... and want it on your M40? Well, have at it! It was the 'outside' gear that was not as common as folks might believe. Even after 911. Did it happen? Yes. Guys bought their own stuff. But not as much as some think. The rifle was NOT suppressed, or set up for one. As I had mentioned in past posts, the M21's we (1st Rgr Bn) had, supposedly had suppressors. I never saw them. And I worked in the shop that coordinated all their training. I saw, what I thought, was all their "special" equipment. Apparently, they were around, though. It's kind of interesting that about the time I got out was when the "equipment boom" really started happening. I remember seeing D-boys with the earpiece headsets, and (at that time) high speed boots, along with what I understood to be custom gear, like assault vests, and hockey helmets. A lot of WWII gear and concepts got brought back into vogue, but it was only the "operator" types that got them customized. I just watched an interview with "Shrek" McPhee and he talked about as soon as he was accepted into "the Unit", the first thing he did was get fitted for custom equipment. Some of the same with the SEAL's but we didn't get to talk to them much, we just saw what they had. Sorry... missed the double negative! Yes, not suppressed. But some of them were. Very few from what I am led to believe. And back in that era, any that were would have probably had a Sionics or Werbell. "Mickey" Finn... made interesting things! Once upon a time, SFOD newbies each got two custom-made 1911's... there is a long history of .45's... or would be if they existed. Starting with the plankowners all getting M3 Grease guns and 1911's before the MP5 came in vogue. The 1911 stayed standard into the post-911 era. Be interesting to know if the 1911 is still the gun of choice. Once upon a time, it was. It was de-rigeur! The 'callous' was a rite of passage. I suspect now it's Sig's or Glock's. But don't know for sure. It was kind of cool though that we saw other units using them. I saw them on the range when I had time up at Bragg between pre- and scuba school. We had guys that went to the Marine Corps Scout Sniper course and swore up and down by the M40's. Even so far as to clearly state they were a better choice than the M21's we had. Especially the scope set-up. The guy who went from my platoon even got high shot that class. We also noted on a couple joint operations, where the sniper on the SEAL teams was a Marine! All of the sniper rifles we saw were composite stocks. No all wood stocks on bolt guns. We had the Wood bottom with the composite forearm cover made of composite. Anybody know what Alan Brown is up to at the moment? Haven't heard from him since the beginning of the year despite trying to get in contact recently. I know Sirhr had a rifle assembled by him, but I am on month 9 or 10 of waiting for mine after sending off components. Took me a 11 months. But he had some health issues in there and got behind after taking in my rifle. He won't forget you and he won't be rushed. So best bet... is relax, he'll get to it! 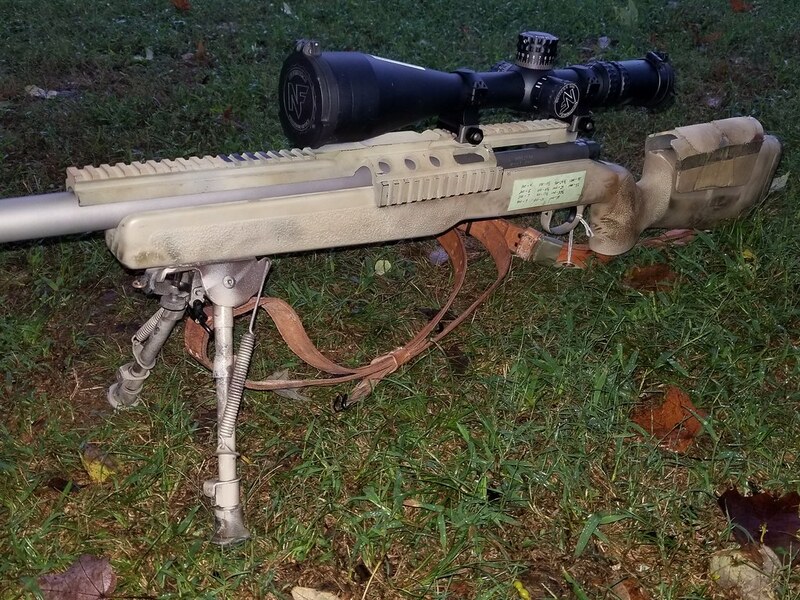 Boowah ha hah ahh aha ha.... love this rifle! I'm sure it'll be here in another month or two...fingers crossed. I wanted him to do mine for a reason, so wanted to make sure I hadn't passed the finish line in terms of waiting. Glad to hear we're on similar scales still, Sirhr. Very jealous of your rig being an absolute shooter out of the box; can only hope for the same in my case. I recieved an email from Alan on July 11th. I would expect a rifle from him to take 12+ months (thats what he told me originally) so patience is your best friend. Just like NFA items, the coolest stuff in the gun world seems to take forever!!!! @sirhrmechanic, I have always enjoyed your posts here on the hide over the years. That being said, I'm mildly annoyed to have discovered this thread as well as having "wasted" half a day reading through it's entirety with a "fiberglassy", lol. I have recently become enamored with the 300 Win Mag and now am fighting the urge to build a MK13 build on any of these return stocks that 0331 might have left. Frankly most military clone builds seemed cool but I have always thought it was a bit silly to obsess over period correct parts that were outdated and heavy or not compatible with civilian suppressors, etc. That may seem blasphemous in this thread but oh well. 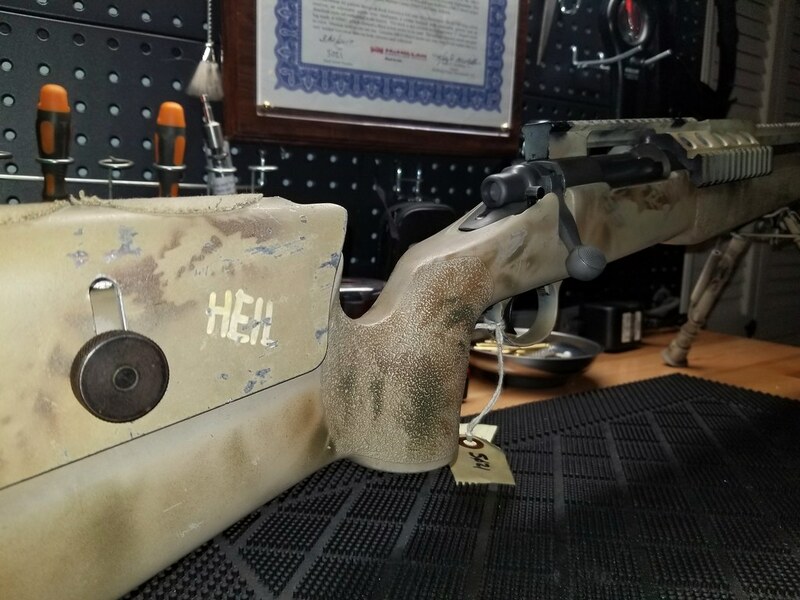 That being said, being able to build on actual stocks used by guys like Chris Kyle and have the original builder put it togetheris pretty freaking cool! If any of you who have one swing through the Denver area let me know, I would love to get behind one at my 1000 yd range and share some burnt powder, stories and food. Is this the Mk13 catch-all thread? If not I'll dial back my content since I'm merely a Mod5 pleb. common issue. You may be able to bevel the extractor a touch to change the angle. 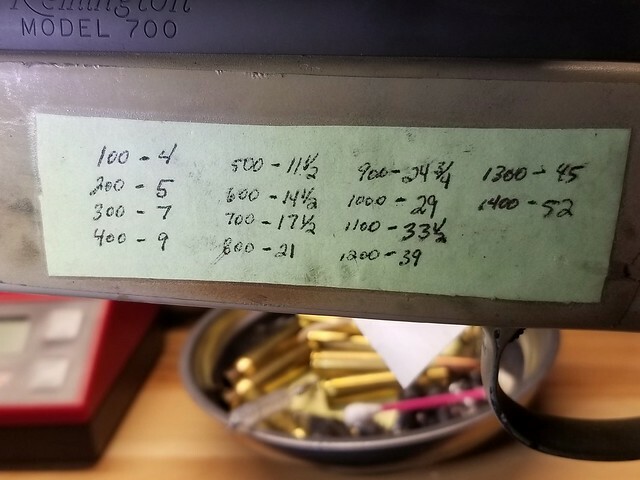 My buddies operational 700/300 (Mk4 rail) was so bad they hack sawed the center section out because the spent cases were dropping back into the ejection port. FatBoy is correct. And this is one of the reasons the Mini-16 extractor was designed and is the preferred extractor now a days over the M16 for extractor retrofits. Have Alan build it for you... the value of having the guy who built the originals... build yours... priceless! And he'es no more expensive than most custom 'Smiths... and knows more than any local shop. When you can get 'the guy' who built the originals... to build your new one? Well, it's like having Carroll Shelby build your Cobra... vs.. having the guys at Mr. Goodwrench do it for you. The quality may be the same... but don't you want 'the guy' to do it? Just google search on AJ Brown (or Alan Brown) Custom Guns. He does a lot of travelling this time of year.... hunting overseas, matches, etc. But he WILL return your call or e-mail. He can do any of the above. His wait times are not short. But he is 100 percent honest about how long things will take. And is totally worth the wait. Totally! Right on schedule! The Lilja guys are totally honest in their wait times. Almost to the day. The quality remains long after the price and the wait-time are forgotten! 3 months is pretty good for a custom barrel. Looking forward to some pics. I wonder how Alan feels about totally rebuilding rifles he built 20+ years ago. Got to be odd to have these in hand again all these years, deployment, etc. later. I definitely can't complain about the wait time - they were actually a little ahead of the estimated "ready" date. If all goes as planned with the big brown truck, then I should have the barrel in a couple of days. Mine came back from Alan today, best mail ever. Alan worked his magic on this one and I'm very pleased. I decided to go with the MilSpec NF. The rifle should be 100% clone correct. I am trying to grow the nuts to paint the scope and barrel. I wish that I knew who Heil was/is. Why does the dope card start at 100=4? I will get it to the range this weekend to start the break in process. Watch your loose sling frog! Hate to see you pick that up and it goes muzzle into the deck on you. Add some 90 mile per hour tape. By the way muzzle in to the deck never occurs onto a pallet of down comforters, its ALWAYS concrete or slabs of granite that your crown pounds in to. I didn't carry it by the sling and took the sling off when I got back in thehouse. It it a little tight and I am going to add some dressing to it.. the bottom it taped. I will tape the top. Good looking out, thanks. Just send one of those moleskins in to 23andME and you will know all sorts of things about Mr. Heil. Hahahahha. I bet I could get a referral discount. That build is amazing, congrats! Nice touch putting that COA in a real frame! Sweet build Pinmaster. What was your wait time? 8 months or so.... well worth the wait. like you, I am in the middle of an A5 build too lol. That means a lot coming from you. Thanks for making the stocks available and steering me towards Alan as the builder. Good eye on the frame. I have my M40A1 certificate in a frame like that, they too good on the wall together. Told you it was worth it... range report?? I hope to get to the range tomorrow. I've been out of town all week. Should be getting mine back from Brown any day I hope; a little past the 12 month mark on waiting... jealous seeing everyone else's rigs. Perhaps one of you deep pocket gunslingers can use it. I see you have a couple 700/300 stocks in there. Nice, that's the first time I have seen you post any up. For that matter, seen any for sale.